Pete Krebs has quite the history in the Northwest rock scene. 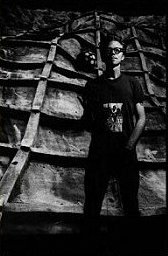 In the late eighties and early nineties he was in an angry three-piece called Thrillhammer, who were known for their aggressive sound and loud live shows. 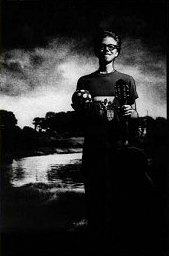 Then, after their demise, he made a name for himself on a national level with Sub Pop's Hazel, who gained enough attention to see their videos played on MTV and appear in a photo shoot for Rolling Stone. Since then, Pete has been performing solo material with a more roots-based sound. Now he's back with his new band, Pete Krebs and the Gossamer Wings, who are ready to show you how rock 'n' roll is done. Blending country and pop with a rock 'n' roll foundation, this isn't alt-country, but rather a rock 'n' roll band with the ability to be diverse. Alex: Was the addition of "Gossamer Wings" to the band title a way to avoid the singer/songwriter tag? Pete: Well, kind of. It was actually more though wanting to, I don't know, let everybody know there was a band there. 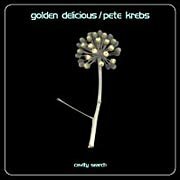 It started off as being just another Pete Krebs solo record. Then, as soon as I realized I had something happening here, and had played some shows, it became really important to me it be known as a band. We're trying to get away from the solo performer thing, but we made it Pete Krebs and the Gossamer Wings because if you start a new band it takes a while for your band name to get out there. And with my name on it, people might know who it is a little bit more. Alex: The Rocket mentioned this was the Gossamer Wings' debut album, does that bug you? Pete: No, not at all. That's true. It's not my debut album, but it's not completely my record. Alex: Are you going to teach the band old songs from your solo records, or is this a new start? Pete: Well, we'll dig up a few songs from the older records and learn them as a band. And then there is one song, "America," which is on a split I did with Golden Delicious, that we're going to vamp up and turn it into a rock song. For the most part, I just want to drive forward. I've already began working on the next record, I just haven't had a chance to teach that to anybody yet. Alex: So, have you entered a studio and started recording for your next record? Pete: I haven't gone into the studio. I record all my stuff on a Walkman with an acoustic guitar. And right before I left, I got two of them down. But there is a good seven or eight songs that are floating around that I just need to finish or record. I haven't even bothered to learn them yet though, to play them live. Pete: I just really liked the songs, and I had been experimenting with them a bit. Then I realized I wanted to do some different things with them, and the Gossamer Wings record was the opportunity to do that, you know? That's pretty much it. I just really liked the songs, and thought they were very good. And if they would have stayed on the split EP, I thought they may have got buried a bit. "America" will be on the next record, and I don't know if "We Never Sleep," which is the forth song, will make it on to anything, but maybe? I'd like to be able to just pluck those songs out of there. This way it will make a break between the songs I'm writing now and Golden Delicious; the two won't necessarily sit side by side anymore. That EP, as far as I know, is being pulled. It won't be available after awhile, because there were some members of Golden Delicious that didn't like the way it was presented. So they're not going to make any more of it, to my knowledge. So once they run out of the ones they have, it won't be available anymore. And I didn't want the songs to just be lost. Alex: Now, the band has a revolving line-up live. Are you also going to have a revolving line-up in the studio? Pete: Well, probably not. I really enjoy having a revolving line-up, but it incurs so much extra work. It's nice to have a band that's static -- a band that's there. So, I've settled on a permanent line-up. I would imagine I'll have Billy Kennedy, who played guitar on the record, and John Moen, who played drums on the record, help me write the next one. The three of us, together, working on the songs, was a really good partnership. John's great at harmonies and arranging, and Billy's good at guitar lines and arranging. So, I'm going to have them help me flush out the ideas. Then I'll bring it to the band, and we'll turn it into a song that the band plays. It's going to be a three-step process. Alex: So the next record will be the complete band in the writing process? Pete: Yeah, to a certain extent. John and Billy aren't in the permanent band any more. I'm playing a bunch of shows with them in the next month or two, but that is gradually going to fall off as spring progresses and summer comes on. But, I would like to involve both of them in the writing process. Alex: How did the SxSW show go? Pete: It went great. We had a lot of fun. It was the debut of the line-up of the band, so it was the first time I played with the bass player and the guitar player. They were a little nervous, but I wasn't all that worried about it. I just figured they'd work out one way or another. I was really pleasantly surprised, because it rocked. We just cranked up the volume and went for it, and it worked. Alex: Was it a packed house? Pete: Yeah, it was a packed house. We got to play with 44 Long and Richmond Fontaine. And it's always a pleasure to play with both those bands. It was kind of a pocket of Portland in Austin. It was really fun. Alex: Do you have any plans to tour? Pete: Yeah, there is going to be a tour in may. I'm really not sure where we're going, but it's going to be a shorty -- probably two or three weeks. So, we'll probably do the West Coast, Texas, and back. Nothing too extreme. But, this summer I'm hoping to tour a lot. I'm hoping that all comes together. I'd really like to get the band out on the road. Alex: Are you going out by yourself, or do you have plans to get a tour mate and hit the roads together? Pete: I'm actually looking for rock bands that might want to play -- with the two bands together -- and we can open for them. I'm not really new to the scene, but the band is new to the scene, so we can't really except to headline a tour. It would just be really fun to do it that way, with a band that we know. I actually talked to Willy from Richmond Fontaine about doing it that way. Alex: That would be a great tour. Alex: On the new album there is some rockers, some folk-ish material, and a lot of country vibes. So would you consider the band an alt-country/No Depression type of band, a rock band, or are you trying to avoid all labels? Pete: I'm definitely trying to avoid all labels, but I'm also trying to distance myself from the alt-country/No Depression label. Because that, to me, is increasingly becoming more and more of a trap. The music that is being described by that is tending to be marginal; it just doesn't throw me. My vision of what the Gossamer Wings can do is to be the type of band that is comfortable playing all types of music -- whether it's punk rock, pop, country-western, Bossa Nova, or whatever. So, the farther I get away from all labels, the better. I'd really just like to be known as a rock 'n' roll band. I just really like to move in that way, to have that type of air and energy. I really just want people to dance and have a good time, and not have it some kind of weird event. I want people to just enjoy themselves. And if they want to enjoy themselves by getting into the lyrics, and doing the whole word thing, great. I think the words are there. But, if they just want to dance or rock out, that's fine. Whatever. Alex: Basically, you're just a fun rock 'n' roll band? Pete: Well, yeah, without making it sound like we're some party band or something like that. But that's the whole thing. It's as serious as you want it to be, and I think it works on a whole bunch of different levels. Alex: Have you decided on the first single from the album? Pete: Not really. I'm not a really good judge of that, because the songs I like on the record are the ones that probably wouldn't make great radio hits. Alex: I know when I was talking to Christopher [co-owner of Pete's record label, Cavity Search Records] about it, he was going, "I think this one would make a great hit, of course this one would too. "Johnny Come Lately" is good, but my favorite right now is "Analog." Then we started talking about it and came to the conclusion the whole album could be hits. Pete: I don't know. I've never really had a single on the radio. I don't know if Hazel qualifies, but I really don't know the first thing about it. I have no clue what to say about that -- it's for someone else to decide. Alex: How does it feel to be focused on one main musical project, compared to focusing on Golden Delicious and your solo career, at the same time, in the past? Pete: It's great. It's very freeing. I feel pretty wide open right now. I'm fortunate enough that the musicians I play with, and the people that are involved in the project at all levels, are really great people and I really like them. When you're in that situation, it sorts of pans out that you have a lot more confidence in what you're doing and your ability to write and make music. It makes me feel really strong and makes me feel like I'm really enjoying the process. I look forward to all the sidelines that go into being in a rock 'n' roll band. I toured quite a bit over the last eight years or so, and my enthusiasm for touring had taken a serious nosedive. I didn't want to sleep on floors anymore. I'm just getting old and cranky. But now I'm really, really excited about the prospect of getting out on the road and touring, because it is so much fun to me right now. It's like, "OK, I get it!" I just wasn't having a lot of fun touring with Golden Delicious, and I wasn't having a lot of fun touring with Hazel. Alex: Yeah, that's kind of Paul Westerberg's reason for not touring now. He just doesn't seem to like it. Pete: Touring can be fun, I've just been conditioned by past experiences when it really wasn't fun at all. I think it's good to get over that for me. Alex: Where would you like to see the Gossamer Wings in a year or two? Pete: I'd like to have another record under our belts, and I'd like to have done a tour through the states. I'd also like to be on a larger label. Somebody that has a little bit more that they can do. Certainly no comment on Cavity Search and their hard work, or anything like that, because they've been really support of everything I've been doing for six or seven years now. But, you know, it would be nice to go and maybe deal with things in a larger pond and see how it floats and works. Alex: I know I talked with you when AIRIANA [Hazel's last album] was released and you were really happy to be off Sub Pop. Are you still tainted as far as bigger labels go, or would you like to give it another shot? Pete: Well, I'd be willing to give it another shot. The benefits tend to be outweighed by the detractors, or the other sides of major labels. I've done this enough times through Hazel that I don't have any illusions about the type of situation you can land yourself in with a larger label. I guess the perfect middle ground is a larger label, with larger resources, that operations like a smaller label. And if there is somebody out there like that, I'd definitely be interested in talking to them. But Cavity Search has always been great to deal with, and I know I'll always have a home there. So, I'm very confident that I won't get stuck out in the snow.